Be the first to share your favorite memory, photo or story of Cary. This memorial page is dedicated for family, friends and future generations to celebrate the life of their loved one. 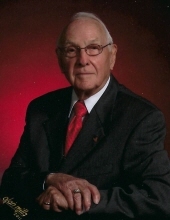 PITTSBORO: Cary Whitehead Becton, 101, passed away on Friday, April 12, 2019 at Pittsboro Christian Village. He was born in Craven County, NC on October 26, 1917 to the late James Bristow Becton and Emily Whitehead Becton. In addition to his parents, he was pre deceased by his wife, Lucille Hill Brooks Becton; son, Bradley Becton; brothers, Macon Becton and Braxton Becton; and sister, Inez Peterson. Mr. Becton was an active member of Braggtown Baptist Church for many years where he served as a deacon and on various committees. He was also a 32nd degree mason, a member of Scottish Rite of Free Masonry of Oklahoma. He was formerly employed as an Engineer with American Airlines for 15 years, and later retired as a Self-employed Accountant. Mr. Becton is survived by step-daughter, Lora DeRubeis; step-sons, Michael Brooks and Robert Brooks; daughter, Marcia Wright; step-daughter, Rosalie Vaught; many grandchildren and great-grandchildren; and special friends Marty and Millard Thacker. A memorial service will be held at 11 a.m. on Wednesday, April 17th at Braggtown Baptist Church with Pastor Eric Burmahl officiating. Visitation with family will follow immediately in the sanctuary. In lieu of flowers, the family request that memorial donations be made to Braggtown Baptist Church, 3218 N. Roxboro Street, Durham, NC 27704; or Pittsboro Christian Village, 1825 East Street, Pittsboro, NC 27312. To send flowers or a remembrance gift to the family of Cary Whitehead Becton, please visit our Tribute Store. "Email Address" would like to share the life celebration of Cary Whitehead Becton. Click on the "link" to go to share a favorite memory or leave a condolence message for the family.